The reason I didn’t make my weekly trip into London last weekend was because I went to Lapland. Yes, where Santa lives. Now before I started working with a travel brand that dealt with holidays to Lapland, I didn’t realise it was a real place. True story. Much like Joey from Friends, I thought it was a mythical place; well Santa isn’t real so why should Lapland be? Except Joey didn’t believe The Netherlands was a real place, as that’s where Peter Pan and Tinkerbell live. Yup, I appear to be more stupid than Joey from Friends, but I always had my suspicions so this has just confirmed my beliefs. Anyway, this was an opportunity with work (yes, my work is that awesome) so I didn’t have to pay a penny for this once in a lifetime trip to the Arctic Circle. How many people do you know have been to the Arctic Circle? I would be seeing some luxury cabins, the Snow Village, meeting Santa and possibly having a ride on a snowmobile or a sleigh ride via husky or reindeer if there was time (I was praying there would be time). It was a one day trip which made it an extremely long day, but how could I complain really? Apart from the fact it had been -35°c earlier in the week! Like a kid going to Disneyland the next morning, I couldn’t sleep because of excitement (which made it an even longer day). I had about 3-4 hours of sleep before waking up at 4am in order to meet everyone at 5.20am before going to the airport. Most of the time in between was spent layering up, bracing myself for the cold I had bought a woolly hat, gloves, thermal socks, trousers and socks (I find the British winter too cold). Safe to say I didn’t say a lot for the first few hours. I’m quiet and shy anyway so I’m unsure if I would have said much had I been wide awake, but I would often find myself staring into space. Did I mention this was going to be a long day? Ha! Anyway, it was supposed to be a three hour flight from London Gatwick to Kittila airport. There was some quiet heavy turbulence in the middle of the flight but that was to be expected with the weather Finland receives I imagined. But my heart sank at what happened next. 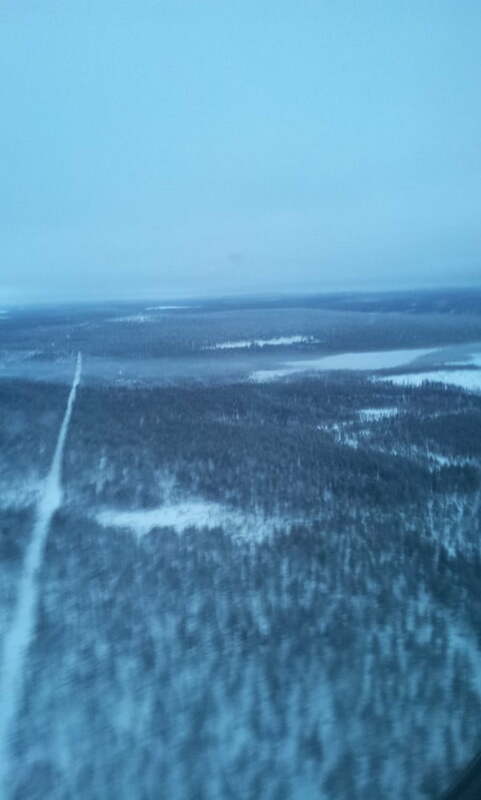 The weather was so severe at Kittila airport we couldn’t land there; instead we had to land at Rovaniemi airport. I’ve just looked that up on Google maps and it suggests it would take just under two hours to drive between the two. With it being a one day trip and already we were pressed for time, there would be no option but to stay near Rovaniemi airport. Still, I was excited, particularly after seeing this view as we landed on a ice-laden runway – possibly the scariest landing I will ever experience as we seem to skidded to a halt! As we were diverted (and as many others would be too) there was a delay in de-boarding the plane as we needed stairs and coaches. After an hour of sitting on a stationary plane, we were transported to somewhere called Santa Park to spend the day. This indoor park was fine I guess, but the huskies and reindeer were nowhere to be seen. Absolutely gutted. As you can probably tell, there wasn’t a whole lot to do at the park. After many complaints from other passengers who found themselves in the same situation but having paid for their trip, everyone was transported to Santa’s Village. This was what I had in mind. Finally we were outside (it was only -4c which was a relief), walking on snow where there beautiful Christmas lights everywhere you looked, a giant Christmas tree, snowman and igloo, Santa’s post office, slides made from piles of snow that children slide down and even reindeer! There wasn’t enough time unfortunately to have a sleigh ride with a reindeer, but looking at it I’m not sure I would have anyway. It looked fed up, transporting four people by itself and probably working for who knows how long. That soured the visit somewhat. Me in the Arctic Circle! We only had about 45 minutes here but it made my experience of Lapland a lot more enjoyable – I only wish we had spent more time there than at Santa’s Park. Back to the airport we went, the mayhem at the airport was overwhelming. With many more flights having been diverted, there was hardly any room in which to move due to mass of bodies and queues everywhere. There was little communication as to what was happening as we crossed our fingers and hoped that we wouldn’t have to stay the night in Lapland. Rumours flew through the air (well planes certainly weren’t) as a flight to London Gatwick was cancelled – please don’t be us we said! Luckily (not for those who had to stay another night of course) it wasn’t us and we departed about an hour later than scheduled. The weather took a turn for the worst as we waited on the icy tarmac with snow falling heavier and heavier and fears of staying the night lingered again but we took off into the snowy night sky. Near the end of the flight, it was announced everyone would receive a refund as a sign of good will. Perhaps it was because it was Christmas, as the travel company didn’t really have to do anything. It’s a shame we never experienced the Lapland that was intended. But considering the circumstances, I still had a pretty good time. Its another place I can cross off my list. Would I recommend a one day trip to Lapland? Probably not. The early flight makes it a really long day so I imagine children would need a nap at some point. Tiredness isn’t the only problem. As you can see, the unpredictable weather could make or break your trip. Sitting on a stationary plane isn’t fun as you can imagine. It’s back to normal with a trip to London tomorrow! Have you been to Lapland? Would you recommend a one day trip? What was your favourite memory? Tell me in the comments section below!